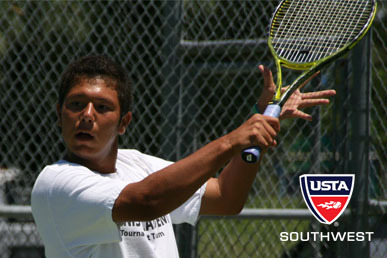 USTA Southwest summer travel teams and coaches for USTA Intersectionals, USTA Zone Team Championships and USTA National Team Championships were announced in late June. These travel teams gave top Southwest juniors the opportunity to compete as a team against top-flight players from other USTA Sections during various competitions throughout July and early August. Teams were chosen based on current Section rankings after the Southwest Junior Closed and player availability. Rosters are listed below. Roster: Nicolas Montoya, Alex Lawson, Nolan Bauer, Jason Jaruvang; Zaina Sufi, Courtney Amos, Rachana Bhat, Stephanie Hu. Coach: Eric Mitchell. Roster: Nathan Ponwith, Yash Parikh, Stefan Koester, Jeremy Auh, Michael Lee, Nathan Niemiec, Carlos Hassey, Shawn Parks, Jesse Miritello, Harrison Reid, Daniel Hollands, Warren Fulgenzi; Maddie Pothoff, Delaney Nothaft, Kylie McKenzie, Reagan Posorske, Melissa Pick, Taylor Bridges, Paris Corley, Sabrina Barkdull, Chloe Weihs, Brandelyn Fulgenzi, Josie Frazier, Alexandra Ochotorena. Coaches: Eric Mitchell, Ford Oliver, Dave Critchley, Ronnie Smith. Roster: Robert Seby, Augustus Ge, Gregory Anderson, Emanuel Llamas, Michael Tran, James Ponwith; Madison Clarke, Sara Parker, Chloe Lee, Savannah Slaysman, Meghan Lyall, Allie Sanford. Coach: Gary Druckman. Roster: Dominic Patrick, Hunter Johnson, Yates Johnson, Jacob Hedderig (pictured-above), Thomas Cooper, Thomas Pecor; Gabrielle Otero, Aleeza Kanner, Sara Brown, Lauren Amos, Maggie Cohen, Alyssa Singh; Coach: Jeff Johnson. Roster: Carlos Bermudez, Mario Urquidi, Daniel Hyman, Cameron Tehrani, Wade Heerboth, Alex Lawson. Coach: Eduardo Vicencio.